Venice is launching a campaign to have gondolas, the traditional flat-bottomed boats rowed down the canals of Venice, added to the UNESCO Intangible Cultural Heritage list. Venice itself is already a UNESCO World Heritage site, as are most Italian art cities, but the Intangible Cultural Heritage list seeks to bring attention to endangered cultural elements, like languages, arts, social practices, festivals and traditional crafts. The gondola qualifies as that last one. 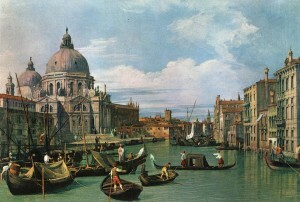 The first documented reference to gondolas is in a letter from a Venetian Republic official written in 1094 and although elements of their design changed over the next thousand years — they varied in size, had little cabins on top for privacy, were sumptuously decorated — gondolas have been a carefully regulated hand-made craft ever since. The black paint convention has been in place since 1562, when the elaborate baroque decorations that were the fashion at the time inspired a sumptuary law compelling all gondole to don a dignified black and limit all embellishments to stern ornament, a pair of seahorses and the multi-pronged ferro at the prow. The first architectural drawing of a gondola was created by a naval artist in 1768. The gondolas made today are almost the same, expect for one interesting change that took place in the late 19th century: the left side is is 10 inches longer than the other. This compensates for the weight of the gondolier and helps tighten turns in the snug and crowded canals. Traditionally made gondolas have 280 components and are made out of eight types of wood (lime, larch, oak, fir, cherry, walnut, elm and mahogany), plus a beech oar. The problem is the craft is in danger. One basic gondola costs $30,000 and in this day of speedboats, gondolas are no longer the quotidian transportation vessel in Venice, but are instead almost entirely peopled by tourists. When gondolas ruled the canals, peaking in the late 18th century, there were 10,000 of them working the water. Now there are 800. Even worse, cheap plastic imitations are coming down the pike. The city’s gondoliers’ association says it takes months of painstaking work to make an authentic gondola and that plans by a shipyard in Brindisi in southern Italy to start producing weather-resistant plastic and fibreglass replicas are “outrageous”. There are fears that plastic gondolas on the canals and backwaters would push the city further down the path of becoming a pastiche, theme park version of itself. Last year, the provincial government opposed the idea of introducing plastic poles to replace the wooden stakes guiding the gondolas for this reason. Along with the gondola, Venice plans to submit its famous Carnival, lace-making on the island of Burano and glass-blowing on the island of Murano to the Intangible Cultural Heritage list. This entry was posted on Tuesday, October 12th, 2010 at 9:43 PM	and is filed under Medieval, Modern(ish), Renaissance, Social policy. You can follow any responses to this entry through the RSS 2.0 feed. You can skip to the end and leave a response. Pinging is currently not allowed.